In Provence, Ford Madox Ford’s rapturous ode to the region, the author describes a recipe given to him by a glamorous young woman from London who was reputed to be one of the best chefs in the city. She shares this recipe for Poulet, Bearnaise, chicken roasted over two pounds of garlic. Ford Maddox Ford was born on December 17, 1973. Joyeux Anniversaire et Bon Appetit! Preheat the oven to 325 degrees. Put a large pot of lightly salted water on to boil. On another burner, place a large ovenproof casserole over medium heat with 1/2 cup of olive oil. Truss the chicken and season it all over with salt and freshly ground black pepper. 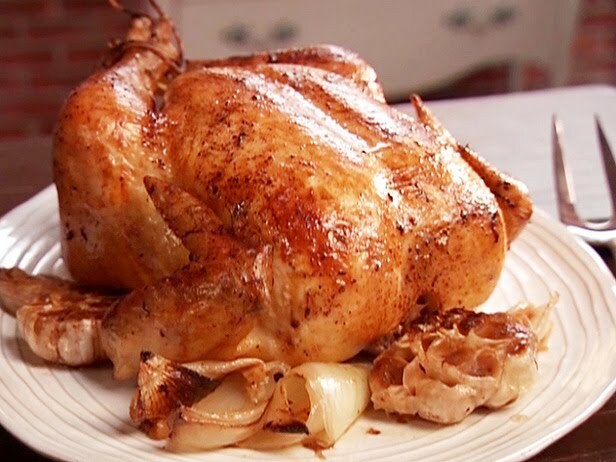 When the oil is hot, gently slide the chicken, breast-down, into the casserole. Brown the chicken carefully on all sides. You will need to move the chicken around every two to three minutes so that the skin doesn't stick. The entire procedure will take about 20 minutes. While the chicken is browning, break the garlic into individual cloves, but do not peel them. When the water boils, blanch the garlic for 2 minutes, drain immediately, refresh under cold running water and set aside. Peel the potatoes, cut each into six pieces and set aside. When the chicken is brown on all sides, remove it from the casserole and push a quarter of the blanched garlic into the cavity and set aside. Discard the used olive oil; wipe the casserole. Add ¼ c. of new olive oil to the bottom of the casserole. Add the remaining garlic cloves and toss so that the cloves are lightly covered in olive oil. Add the chicken and baste it with 2 tablespoons of olive oil. Place another skillet over high heat; add the remaining 2 T. of the olive oil. When the oil is hot, quickly brown the potatoes. Discard the oil and arrange the potatoes around the chicken. Cover the casserole, put in the oven and bake for 90 minutes. Allow the chicken to rest at room temperature for 10 minutes before serving. Hi, I'm typing this on a wet Sunday afternoon as I also peel 750gr of garlic cloves for the Poulet Béarnais my wife will cook later. I happened to be reading this morning from French Country Cooking by Elizabeth David where she recounts Ford's story of the English mannequin who was also a very good cook but you have it as Poulet Béarnaise from Provence. If it is Béarnaise then it has to be from the region of Béarn down in the Pyrenees near Bayonne and Pau and not Provence on the other side of the country. I hope you don't mind me writing this, but apart from that I haven't found any other separate recipes for Béarnais, which clearly this Poulet Béarnais is...even in my old Larousse Gastronomique. Sorry to be picky, but it appears that you might need to correct two typos in the sentence, "Ford Maddox Ford was born on December 17, 1973." Typo 1: It should say "Madox," not Maddox." Typo 2: It should say "1873," not "1973."